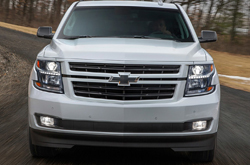 What's New for the 2019 Chevrolet Suburban? Whether you are looking for a heavy-duty work vehicle or an SUV that provides enough space and power for family, friends, and grown-up toys - the 2019 Chevrolet Suburban has you covered. The Performance Edition offers a Rally Sports Truck Edition with a 10-speed automatic transmission and 170-amp alternator. The two-speed transfer case on the 4WD, Sports calibration and trailer brake controller, in addition, to the active noise cancellation makes this Suburban fun to drive. You can also purchase the vehicle in Black, Shadow Gray Metallic, Summit White, and Silver Ice Metallic to show off your own unique style. The newest Suburban comes in LS, LT and Premier trim with each offering something special. The LS is your most affordable option and comes in 2 or 4-wheel drive and provides seating for eight to nine passengers with plenty of room for all their stuff. 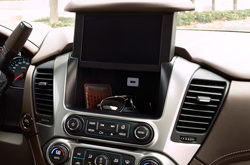 Apple Carplay and Android Auto, power adjust seats and three-zone climate control are also standard. The V8 engine and six-speed automatic transmission offers about 18 MPG and comes in six exteriors and five interior colors. In addition to all the LS standard features, the LT offers leather heated seats and an upgraded Bose sound system. The added safety features include lane assist and forward collision alert in addition to a power liftgate with a programmable height adjustment. Of course with added features, comes an added price. If riding in comfort and style is on your agenda, Premier Trim offers luxury and confidence. The Magnetic Ride Control gives you a smooth commute and the keyless open and start are convenient. You will love the front and rear park assist in addition to the hands-free gesture liftgate. Ventilated front seats, blind spot monitors and black accents and badges offer style and character. For entertainment, the Chevrolet MyLink with an 8-inch diagonal color touchscreen with navigation will give you confidence on the open road. What's Under the Hood of the Suburban? Power and reliability are key features in the 2019 Suburban. The 5.3-liter V8 engine offers 355 horsepower in addition to 383 pound-feet of torque in both the rear and four-wheel drive options. The six-speed automatic gives you the power you need when you need it. If you want even more power, the 6.2-liter V8 is offered on the RST and Premier Plus options giving you 420 hp and 460 pound-feet of torque. The 10-speed automatic transmission is easy to drive and can tow around 8,200 pounds. 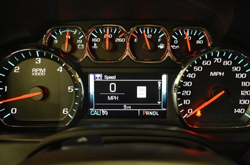 How is Chevrolet Innovating Safety Technologies? 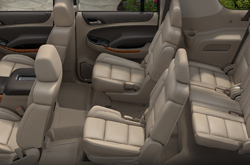 As a truck-based SUV, the Chevrolet Suburban provides several safety features including seven airbags in vehicles without a bench seat in the front. This added feature is to help stop front seat passengers from colliding if there is a crash. Stability control and anti-lock brakes are also standard, and an enhanced Driver Alert Package offers emergency braking, active lane control, and automatic high-beam headlights are standard on the LT and Premier trims and an option on the LS.